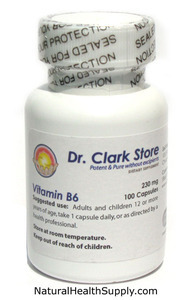 Each bottle contains 100 gelatin capsule of 230 mg of Vitamin B6, also known as Pyridoxine Hydrochloride, guaranteed pure and potent from the Self Health Resource Center. No binders, no coatings, no dye. Suggested Use: Adults and children 12 or more years of age, take 1 capsule daily or as directed by a health professional.